Nancy J. Farrier here. I am happy to welcome Karen Witemeyer as my guest blogger today. She is one of my favorite authors. Enjoy her post and then take the time to read her books. You will be delighted to read her engaging stories. What was the leading industry in Texas at the turn of the 20th century? Oil? - No, that came later. Lumber? Are you kidding? I live in Texas. There are no trees. Oh, we've got some scrubby little mesquite and an occasional oak, but nothing that this California native would call a tree. So how in the world did the lumber industry out-perform cattle and cotton, two Texas staples? Well, as anyone who has ever driven across this great state can tell you, Texas is a big place. Yes we have desert regions and prairie and grassland and hill country, but over in the southeast is a lovely section called the Piney Woods. 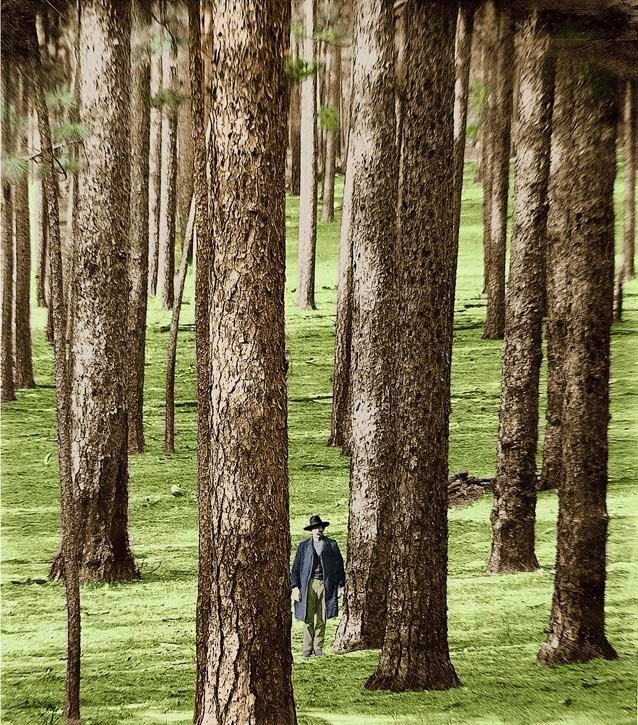 And as the railroad worked its way west in the 1870's and 1880's, lumber men from Pennsylvania like Henry Lutcher and G. Bedell Moore saw the virgin forests of east Texas as a gold mine. Local boys like John Henry Kirby got in on the action, too, buying up and consolidating individual sawmills into complete lumber manufacturing plants. Kirby rose to success so quickly, he became known as the "Prince of the Pines," having become the largest lumber manufacturer in the state by combining 14 sawmills into the Kirby Lumber Company in 1901. Not only did the railroad boom make travel to the Texas woods easier, it was also one of the biggest sources of demand for timber. Railroads needed lumber to construct rail cars, stations, fences, and cross ties in addition to the massive amounts of wood they burned for fuel. Each year railroads needed some 73 million ties for the construction of new rail lines and the maintenance of old ones, estimated by the magazine Scientific American in 1890. 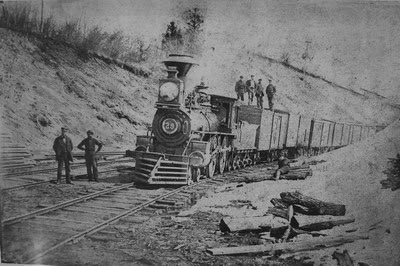 From the 1870s to 1900, railroads used as much as a fourth of national timber production. This combination of supply and demand fueled a "bonanza era" for the Texas lumber industry that lasted 50 years, from 1880 until the Great Depression. During this time, Texas became the third largest lumber-producing state in the nation. Northern investors swooped in to buy up land, sometimes even taking advantage of "use and possession laws" to seize property from families who had owned it for generations. Corruption abounded as logging companies controlled their workers, paying them only in vouchers for the company store despite the incredibly hazardous working conditions. These "cut and get out" operations left acres of land decimated. This is the climate in which the Archer brothers dwelled on their pine-heavy ranch in Anderson County. Travis, Crockett, Bowie (though he only answers to Jim), and Neill Archer are Texas men through and through. All named for heroes from the Alamo, they know how to fight for what is important—family. Travis and Jim found their happily ever after in Short-Straw Bride, Crockett found his with an outlaw's daughter in Stealing the Preacher, and now it's Neill's turn as part of the novella collection, A Match Made in Texas. Be looking for Neill Archer's story January 1st! Tired of living in the shadow of his older brothers, Neill Archer leaves the family ranch, determined to prove himself his own man. After two years of doing everything from laying railroad track to driving cattle, he's nearly saved enough to purchase his own spread. While passing through a small town in the Texas panhandle, a handwritten ad literally falls into his lap during the local church service and convinces Neill that God is steering him toward his next job. There are two things Clara Danvers cannot hide—her grandmother's Comanche blood and her hugely pregnant stomach. After her husband got himself shot cheating at cards six months back, she has worked hard to make the shabby cabin he'd left behind truly hers. But there are some things a pregnant woman can't repair, and a leaky roof is one of them. When a handsome cowboy shows up at her door with a tale about a nameless woman hiring him to fix her roof, she's suspicious but desperate enough to let him work. Scarred by the men who have failed her in the past, Clara is forced to trust the stranger when danger threatens her child. Neill might prove to be an able protector, but can she trust him with the battered remains of her heart? 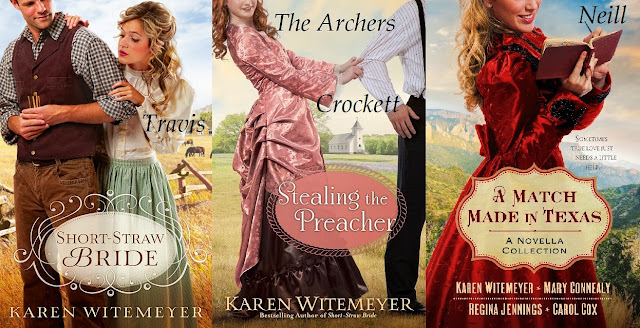 Two-time RITA® Finalist and winner of the coveted HOLT Medallion and ACFW Carol Award, CBA bestselling author, Karen Witemeyer, writes historical romance fiction for Bethany House, believing that the world needs more happily-ever-afters. She is an avid cross-stitcher, shower singer, and bakes a mean apple cobbler. Karen makes her home in Abilene, TX with her husband and three children. Learn more about Karen and her books at: www.karenwitemeyer.com. Thanks for guest posting today, Karen! Didn't realize you had Neill's story out! I have absolutely LOVED this series. Can't wait to read this one. Hmmmm wonder if it's too late to put on my Christmas list! I just couldn't let those Archer brothers go without giving Neill his own happily ever after. Karen, I just finished reading Neill and Clara's story last night! Wonderful story--a Christmas present to your readers! Glad to have you visiting with us today! Hey, Patty. Yay! I'm so excited you got hold of an early copy. I had fun turning the tables on the Archer tradition by having Clara meet him with a gun pointed at him instead of the other way around. I'm so glad you enjoyed it. The rest of the stories in the collection are fun, too. Hope you love them all! You certainly made me want to read the latest Archer story! Love your books! Thanks, Rebecca! Have a wonderful Christmas! I'm always amazed at what I uncover during research, Vera. Sometimes it's hard not to throw all the juicy tidbits into the story. The three of us who would be interested would probably still prefer the story to the history lesson, though. Ha! This is so unfair! 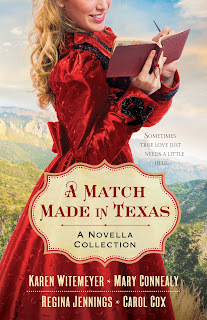 I can't read "A Match Made in Texas" until AFTER Christmas. It's killing me. Only a week to go. I think I can make it. You can do it! :-) There will be plenty of sugar plums dancing around between now and then to keep you distracted, I'm sure. I'm delighted that you are looking forward to it so eagerly. Hope it lives up to your expectations. Karen, I can't wait to read your latest book. Of course, I'm usually third in line to read one of your books, since my daughters love them so much. Thank you for sharing such an interesting post today. Thanks for writing Karen. I love your books! I'll have to read Neill's story soon! I did not know any of that about the railroad business. This was a really interesting post and I am definitely looking forward to Neill's story as I thoroughly enjoyed reading about the other Archer brothers. Hi Karen, thanks for a delightful post. I spent 30+ years in Texas - ended up in the piney woods of Bastrop County - mainly because of the trees. We cleared only enough yardage on our 2.5 acres to put in the house and left the rest untouched. Didn't even clear out the back for landscaping. It was amazing to think that it was as it had been since the great flood. Love trees. Now we live in the San Juan National Forest at Chimney Rock Colorado. Really loving those tall, evergreen trees. Looking forward to reading more of your guest posts. Hi Karen! Thanks for making the lumber and railroad business in Texas sound so interesting! I have all of your books except Head in the Clouds & Stealing the Preacher but I had not tied these last three together w/ the Archer boys. At least now I know to read them in order with A Cowboy Unmatched pulling up the rear! Merry Christmas and I loved Tailor Made Bride - the only one of yours I've read yet. Every time I work out I giggle and think of how I'm going on my daily "constitutional!" That is one piece of history I actually knew! Even though Texas is so sparse (what little I ever see, lol) I thought only tumbleweeds grew there. :) Great post! I love Karen's books! 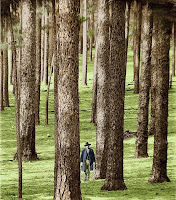 Thanks for posting about the piney woods :) Loved it!